I’ve been asked to design a rectangular frame with a geo metric profile. …so the section of the frame along the straight side must be curved. Using FreeCAD, as usual, it is indeed child’s play to draw the sketch of the section of the frame, as well as to sweep it either along the arc of circumference or along a straight segment, but… the section of the frame along the straight side must be curved to match exactly the curvature of the arched side with the above geometric (not curved) section and to follow the pipe’s shape. Taking into account the symmetry of the final frame, it is enough to design a quarter of it, with the curved and the straight half sides matching at the corner. As first attempt I draw the cylinder sector corresponding to the frame, then I extract the curved surface with the Face Binder tool and I extract the outer perimeter of the surface: it is the path along which the frame will be built. I position the sketch of the section with the proper orientation, exactly at one vertex and I sweep it along the curved side of the path. The generated curved side of the frame must be cut at 45° w.r.t. the section plane, to match it with the linear side to be designed:on the sketch of the frame section I draw a rectangle, bigger than the section shape and sharing it’s external edge, I revolve it around the shared edge for 45 degrees inwards to the frame: the generated wedge can be used as cut tool to chamfer the rectangular ended curved frame side. The new 45 deg sloping end face can be extracted (again with the Face Binder tool) and swept along the straight side of the path. The generated half straight side will perfectly match the curved side at the corner, but will end with a 45° sloping face, which will completely intersect and overlap with the corresponding ending in its mirrored copy. The first prototype, ready before the deadline was fine. I was nevertheless not yet satisfied of this solution: working fine but not elegant from a design point of view. In the next post, the next design solution. Drawing a blank credit card is an easy task. The fun comes when trying to add the company name and logo: the extrusion of the company name needed just a resizing and positioning, while the gearwheel logo has been more tricky. 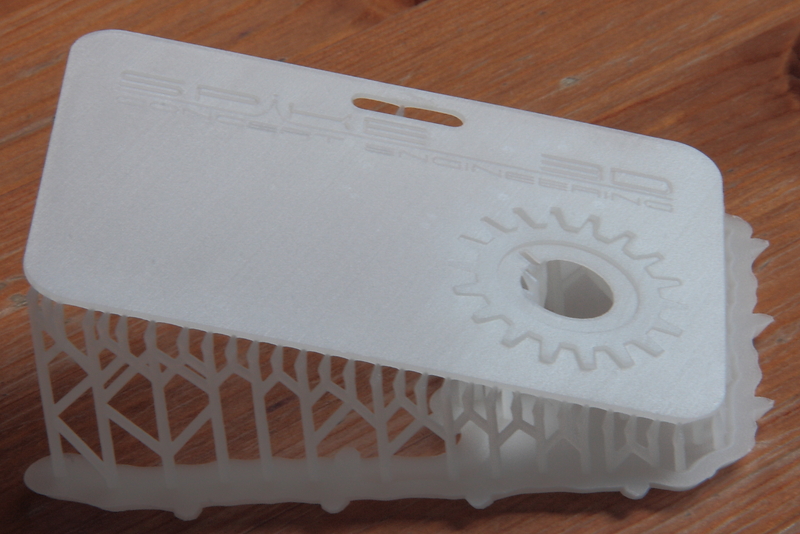 My idea was to include the core of the gearwheel design in the id badge, keeping it “low relief”. As in the business card the gear appears tilted and turned, I tried to reproduce the same positioning in 3D, I cut out from the badge card the tilted and turned extrusion of the full twisted gear and then I inserted in the cutout hole a thin slice, cut symmetrically around the plane where the inside cut changes shape, as well positioned and tilted. After adding a cutout hole for the clip badge holder, I sent it to the printer. For this first print run I choose to engrave the company name (as an alternative of having it also as low relief) and to use white resin. Printer setup for the badge print run, with the automatically generated print supports. 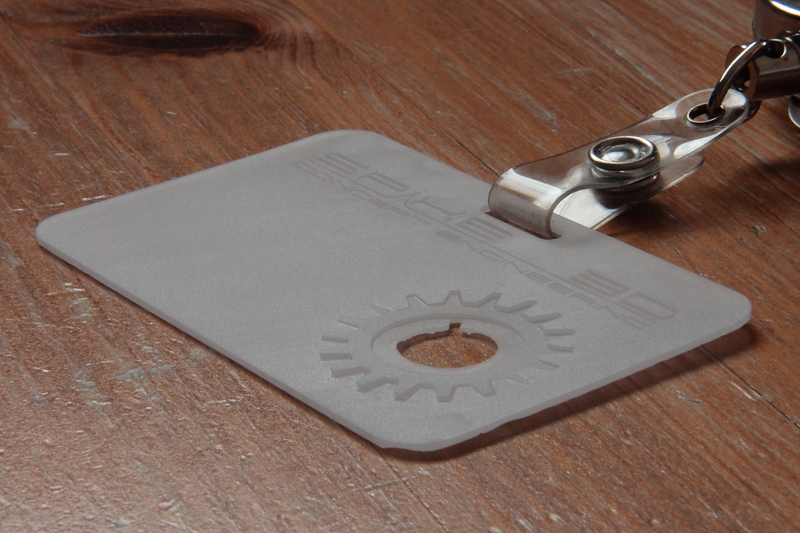 According to the prototype results, I will add the name of the card holder and have it printed in metal. The basic shape of the logo is a twisted gear, which was generated with one code line with OpenSCAD. The original object is too big to be used directly in the 3d badge. As FreeCAD does not offer so many options to manipulate stl objects (as, for example, Blender does), I decided to generate the same gear using FreeCAD tools (and to consider it for me a challenge to learn more FreeCAD features tipps and tricks, instead of a “not so skilled” way to complicate my life as a designer when a clean and easy way as software developer would be at hand 😉 ). I had available the section of the gear in svg format, easy to be imported inside FreeCAD, but as FreeCAD does not offer yet the possibility to twist a surface while extruding it, I had to find a different way to build the twisted gear. I based my construction on FreeCAD arrays: I drew a sketch of the single element of the gearwheel rim (the “tooth”) on the x-y plane and generated the gearwheel section as a polar array of the “tooth” sketch. The basic idea was to place a copy of the gearwheel section at a different height along the z axis, rotate it, and connect the two with the “loft” tool. As there is no possibility to define a correspondence between points of the two curves, I had to play a little bit with the relative rotation of the two gear sections, to see how the “loft” tool behaved, according to the rotation angle (if it is equal to the sector occupied by a “tooth”, then the extrusion is vertical connecting to corresponding subsequent “teeth”on the two sections, not twisted to connect a “tooth”on the bottom the corresponding rotated “tooth” on the top profile). At the end I found out that I could have the ascending anticlockwise twist with a rotation angle up to 5º. The solution automatically became: an “ortho” array of 6 slice elements of the gear, rotated one w.r.t. the other of 5º. Considering that the gear section is a polar array of 18 “teeth”, merged in a single sketch, I created an “ortho” array of “lofts” elements connecting two copies of the same “polar” array of the single “tooth” of the gear. This is really building a whole from the single element 😀 . (Yes, I’m aware of the one code line with OpenSCAD, but where would be the 3d designer fun? I would have been the same proud as a coder, had I written myself that one code line…). No need to enter details about the inside cavity: a cylinder and a cube used as cutout tool for a Boolean “difference” with the gear. Now that our company is starting, we use the Fablab facility for professionals. It would be nice to wear a corporate id badge. As we are three associates, using our living rooms respectively as R&D office and test lab, we have no need of an usual id badge to check in and out at the company gate (we have the key for both the main building entrance and of our apartment doors). Then the idea came to my mind to design a 3d corporate badge, to gain more company visibility when we are at the FabLab workshop, printing our prototypes, or we take part to workshops, sharing ideas with other professionals. Wanting to keep the same appearance of the business cards, I asked Lorenzo for the original objects he used to draw them: a path from Inkscape for the company name and an stl object generated and exported with OpenSCAD for the twisted gear. I needed to reproduce the s ame shapes in 3D with Freecad, with the obvious size limits (especially in the overall thickness) of a “nearly flat” credit card like badge. If I may allow myself the comparison, without being too arrogant with respect to real sculptors, I needed to create a “low relief” of the business card objects. Before importing the Inkscape path of the company name inside FreeCAD, I flattened the path’s Bezier’s curve turning into an approximation composed of straight-line paths and reduced to only one node the agglomeration of nodes sometimes created by the conversion: in this way once imported the svg file inside FreeCAD, it can be handled as a set of lines (or “edges”) and there is no risk to convert an Inkscape closed path into a FreeCAD open path if the wrong node in the agglomeration is kept in the import. This made a lot easier to h ave all the letters as surfaces and extract the internal cutout surfaces (for letters like “P” or “D”) to create by boolean difference the exact text-shape to be extruded. To be complete, I added two “bridges” over the cutouts for the bogies, to hang them and I designed the case for the engine, to be hosted in the chassis. The engine case is shaped to host the engine inside it and the cover designed to be fastened by screws to it.